Was Danielle Fishel Originally Cast on Boy Meets World in Another, Non-Topanga Role? « Was the Song “Mony Mony” Written About a New York Bank? TV URBAN LEGEND: Danielle Fishel was originally cast in another non-Topanga role in Boy Meets World. The enduring popularity of Boy Meets World is one of those rare occurrences where a show that was only relatively popular when it was originally airing (Boy Meets World never finished in the top thirty in the Nielsen ratings – it peaked at #36 in Season 2) finds a new life in syndication (the most famous example of this phenomenon is The Brady Bunch, which also never hit the top thirty during its original run). After finishing its original run on ABC, it was syndicated for seven seasons on the Disney Channel and three seasons on ABC Family. It was off the air for a couple of years before it returned to ABC Family in 2010 and has actually gotten more popular in recent years, with MTV2 also adding the show to its schedule in 2011. The recent increase in popularity led to the Disney Channel debuting a sequel to the original series, Girl Meets World, starring the pre-teen daughter of the show’s main couple, Cory and Topanga (Ben Savage and Danielle Fishel). That series is currently in its second season. Like many television series, Boy Meets World spent its first season tinkering with the show’s formula to get the best set-up going forward. Rider Strong played Shawn, the best friend of Cory Matthews, but the show wanted to develop a second best friend. In a number of episodes, they tried out new actors as Cory’s second best friend. None of them took. It got to the point where the actors would refer to the third seat at lunch with Cory and Shawn as the “seat of death,” since every actor who took that spot was replaced. The show was in so much flux that their quest for a second best friend for Cory ended up with Shawn gaining a sister for a single episode. In an early episode, the plot originally hinged on the sister of Cory’s second friend (whoever it would have been that episode) messing up Cory’s hair to amusing effect. As the episode went along, though, the writers felt that they didn’t have room for this new actor in the episode but they needed the sister for the sake of the plot, so they gave the other actor’s lines to Rider Strong and the end result was that, for a single episode, it was Shawn who had a sister that would work on Cory’s hair (and screw it up to amusing effect). Shawn’s sister was never mentioned again. 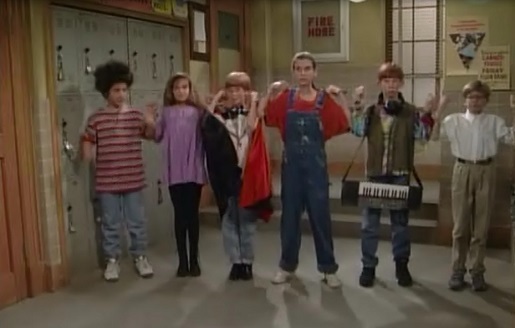 The episode in question was titled “Cory’s Alternative Friends,” as Cory is forced to hang out with the geeky kids in class after his hair mishap leaves him a social pariah. He ends up banding together with the misfits to stage a protest against the school board for forcing out the school’s librarian. Their protest (handcuffing themselves to the school’s lockers to block kids from exiting the school on Friday afternoon) succeeds and one of the girls in the group is so impressed with Cory that she gives him his first kiss. That girl was Topanga Lawrence, a modern day flower child (show creator Michael Jacobs came up with the name for the character while driving past Topanga Canyon in California, which was a popular spot for hippies during the 1960s). Her role in the episode was a notable one and the producers made it clear that they were considering making the role a recurring one (likely with the intent of ending their “second best friend” experiment). Danielle Fishel auditioned for the role of Topanga but lost it to another young actress. Fishel then auditioned for a small role on the show and got that part. As it turned out, the new role was going to be in the same episode that Topanga would first appear in (the fourth episode of the series). The class is paired up for science projects. Cory and Shawn are initially a team before their teacher, Mr. Feeny (William Daniels) splits them up and makes Cory work with Topanga instead. The episode opens with two girls doing a project about how certain chemicals could cause dangerous algae blooms that can kill off fish in water sources. Originally the two girls were to be played by Fishel and Marla Sokoloff (who later got a recurring role on Full House as Stephanie’s best friend and then became a cast member of The Practice). I showed up to work and realized that my part was in the same episode as the role of Topanga. This was pretty cool, because I got to see how the girl who got the job acted the part out. They obviously liked her, so maybe I could learn something from her. First of all, this girl was incredibly sweet. She was also very talented. The role was meant for someone who could talk very slowly and still be funny. She seemed to know how to do that. I watched her work with our director the whole first day. Even though I had been in acting classes before, this was like my first real lesson. It changed my life. unprofessional, so I kept my mouth shut. On set the next day, she wasn’t there. They had let her go, and the executive producer, Michael Jacobs, needed to find a new girl to play Topanga. To this day, I don’t know why Michael gave me another opportunity to audition for Topanga, although I suspect it was because it was easier than having to do a whole new casting call, but he did. It was down to me and another girl, Marla Sokoloff, who was also doing a guest spot on the episode. Fishel beat out Sokoloff for the part, but notes that that was not the end of her worries, as her first table read as the new Topanga went poorly, as Fishel was pretty much the opposite of a “flower child” at the time, so she had difficulty getting herself in that frame of mind. Her natural style was peppy and preppy and Topanga was anything but that (although, as Fishel became a recurring character on the shoe and eventually one of the show’s leads, they changed Topanga’s personality to be closer to Fishel’s). Jacobs gave her extensive notes and warned her that if she didn’t improve the next day he would replace her (Sokoloff, after all, was still on set). The run-through came and went, and once again, I felt pretty good about what I had done. This time, however, I was painfully aware that I had felt the same way the day before, when I was told my whole performance needed to change if I wanted to keep my job. storm out of there? “However, with your performance today, you exceeded my expectations,” he concluded. He started clapping, and all the writers stood up and clapped next to him. Michael wasn’t going to fire me. He believed in me. He gave me a freaking standing ovation. The rest is teen sitcom history! This entry was posted on Tuesday, June 23rd, 2015 at 7:00 am	and is filed under TV Urban Legends Revealed. You can follow any responses to this entry through the RSS 2.0 feed. You can leave a response, or trackback from your own site.